In an effort to improve traffic flow and deter Georgia drivers from driving too slowly in the left lane, Georgia House Bill 459, better known as the Slow Poke Law went into effect on July 1, 2014. House Bill 459 revises O.C.G.A. § 40-6-184 (Impeding Traffic Flow / Minimum Speed Requirement) by adding a new subsection (c). The new subsection prohibits operation of a vehicle in the left-hand lane of a controlled-access highway except to pass another vehicle. This prohibition would not apply in seven specifically enumerated situations. Please see the “Wording of the New Law” section below. HB 459 revises O.C.G.A. § 40-6-184 (Impeding Traffic Flow / Minimum Speed Requirement) by adding a new subsection (c). New law effective July 1, 2014. 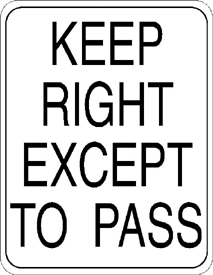 – Current law states that a driver should keep right except to pass. – The newly added subsection (c) adds more emphasis on the importance of adhering to that rule, and adds penalties for not following the law. Drivers in the fast lane driving under the speed limit are now expected to move into the right lane. In fact, current law dictates that a driver should keep right except to pass. The new law just puts more emphasis on the importance of adhering to that rule, and adds potential penalties. Of course, exceptions to the law apply, such as when there is inclement weather, driving in a construction zone or when exiting the freeway on the left. – With slower drivers out of the left lane, it makes it easier for police to identify speeders. – Emergency Vehicles have an easier time getting to their destination. – Many times a driver will slow down to block a speeder. It is important that drivers leave the speed enforcement up to law enforcement, as is sometimes seen when a driver will deliberately drive at the posted speed limit or below, to purposely prevent drivers from going over the speed limit. When drivers behave this way, safety becomes a big factor as they can sometimes create a bottleneck in traffic and instigate road rage from other drivers. – Many times aggressive driving is in response to fast drivers encountering slower drivers. Georgia lawmakers are hopeful that the new law will minimize aggressive driving including road rage and tailgating. And, just as important, make it easier for emergency vehicles and law enforcement to travel the roadways in the event of an emergency. This new law really boils down to making the roads safer for everyone. Although a $1,000 fine sounds excessive, this violation is categorized as a misdemeanor and misdemeanors in Georgia carry penalties of up to a $1,000.00 fine and up to one year in jail. – It appears that this will be a 3 point violation. date and applicability; to repeal conflicting laws; and for other purposes.